My first ever cake. Please don't laugh! Nothing wrong with your cake, Scott. Very pretty, and it looks delicious! That's a nice-looking cake. What flavor is the cake? BTW, should you be dating a five-year old? I know! It's not the most impressive cake is it! But like a said, it was my first go! it is a Victoria sponge cake and, just for the record, she is 35! The most important thing is how she reacted. If she was pleased you did that, you shouldn't care what we think. she loved it by the way. 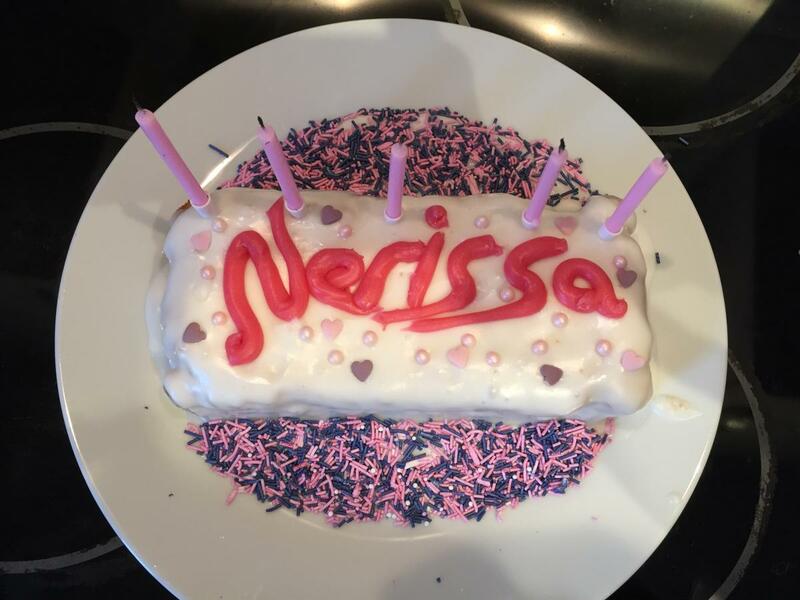 No one had ever made a cake for her before so she didn't mind it being a bit childish and rough around the edges! That's great! Now you can cook her dinner. Oh I've already done that Andy, it looked even worse than the cake! Pretty cake, and pretty name! Well done Scott. I can cook, but I can't bake, yours looks great. Good lookin' cake there, Scott! Absolutely nothing wrong with it and anyway it's the thought that counts and if she's a girlfriend worth her salt she'd be thrilled.